Berlin Beauty : Bling it Yourself: Glam Shorts! 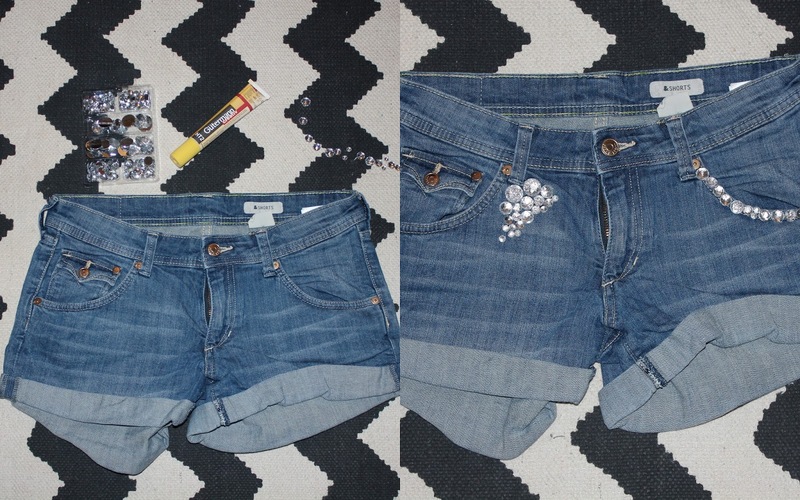 This is a quick and easy way to add sparkle to an old pair of shorts or jeans. If you buy the glue accordingly, you can also bling out your shoes, bags or any other fabric! Step 1: I arrange the rhinestones the way I want to on my shorts. I do this before applying glue so I don’t end up with a glue-y mess if I change my mind. Step 2: Next, I either glue the rhinestones on individually or put the glue where I want to add rhinestones later. On the pocket I drew a line, on the left side I glued individually. Step 3: Wait to dry! Tip: If you wash your shorts before hand, the glue supposedly sticks better. Let me know how your attempts go- I would love to see!